A big, humanely raised bird deserves to be utilized to the max and in deliciously diverse ways. My son’s 16-year-old, 6-foot-5 body plays both basketball and standing bass and requires copious amounts of fuel. My daily dinner budget hovers around $25 to feed the four of us. These travel very well in packed lunches. To make the recipe vegetarian, swap in scrambled eggs for the chicken. Vegans can leave out the chicken altogether. Leftover sticky rice works best here if you’ve got it. Place chives (or scallions) in a bowl and pour boiling water over them. Let sit for 30 seconds, then drain. Set aside. Heat oil in small skillet. When hot, add mushrooms and coat them with oil. Cook them over high heat – without stirring – until one side of the mushrooms caramelize. Remove mushrooms from the pan and set aside. Stir together rice vinegar, sugar, carrots and radishes. Take 1 collard leaf and cut off any large part of the stem. Press your finger along the remaining part of the leaf’s rib to relax it a bit. Lay the leaf flat. In the middle of the leaf, place a tablespoon of rice. Top rice with 2 tablespoons chicken, a few mushrooms and some carrot-radish pickle. Finish with a few cilantro leaves. Fold in the sides of the leaf over the top of the filling and roll it up away from you. Repeat until the collard leaves are used up. 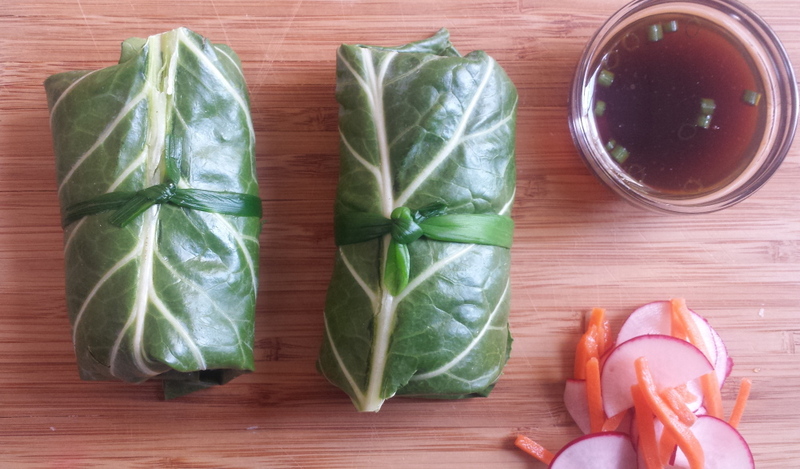 Secure each wrap with a blanched scallion or chive ribbon. To make the dipping sauce, combine all the ingredients plus 3 tablespoons water in a small bowl. Serve with wraps. These two facts in my life don’t always jibe, especially when I factor in the cost of sustainably reared proteins. I can hit the mark on all three points four, maybe, five times a week with the help of a full repertoire of sausage and pasta dishes; exploration of the cheaper, white, flaky fishes like pollock and cusk; and an ability to stretch a local chicken a country mile, or at least across three meals. To make the cook-once, eat-three-times chicken policy work, I have to bring home the biggest whole bird in the cooler at the farmers market. Most weeks that sets me back at least $20. I typically roast a chicken the first time it goes into the pan, stuffed with herbs and a spent lemon, breast side down at very high heat for 30 minutes, and finished breast side up in a moderate oven until the legs wiggle easily, indicating doneness. I serve the tender white meat and crispy wings with mashed potatoes, pan gravy and a couple of green vegetables. On day two, I shred the dark meat for either chicken and black bean tacos or Asian Chicken, Mushroom and Collard Green Wraps (see recipe). For meal three, the carcass gets picked clean of meat and the bones recycled in a stockpot where they are transformed into chicken and rice soup, fortified with chopped carrots and very thin slices of an aged cheese, such as Provolone or Muenster, lining the bowl, a trick handed down to me by my Nonna, one of 16 kids. She learned to cook in the 1930s and was a master of frugal but flavorful meals. She needed to be. In “An Everlasting Meal, Cooking with Economy and Grace,” writer Tamar Adler espouses this three-meals-per-chicken rule, too. But she argues for simmering a well-salted, room-temperature bird slowly, covered in water with a few stock staples like carrot peels, onion skins and celery tops, and judiciously employed spices like cinnamon or star anise. This technique, she writes, doesn’t intimidate the cook and is gentle on the tender protein. Adding pieces of turnips, potatoes, leeks and parsnips to the pot to cook with the bird at the tail end of the simmering, which then get served as side dishes with an herby salsa verde, also makes a richer second day broth. This liquid gold requires only a few floating ravioli and some cracked black pepper to make a satisfying meal, Adler writes. Moving beyond the flavorful frugality of pulling off what is essentially classic French chicken pot-au-feu, this cooking process consumes just about half the energy my own roast-first, boil-later local-chicken-stretching routine does, because it cooks the meat and vegetables and makes the broth in one efficient operation. Yes, you sacrifice the crispy skin of the roasted chicken. On the other hand, Adler points out that you can skim the fat from the top of the pot of broth once it has cooled and use that to sauté vegetables or smear on toast. Whether you take my roasted route or Adler’s boiled one, you’ve whittled down the cost of the bird to under $7 per meal. Not a bad price to pay for any chicken, let alone one of this quality and sustainable standing.